The “Super Trend Profit system” is a complete trading tool designed primarily to trade TRENDS successfully and consistently.The indicator is based on a special system that predicts the price movement in advance! The main principle of the indicator is special custom trend indicators complex . We have add a filter of the direction formed by two indicators: daily open and weekly open. Time Frame: 30min, 60 min. Currecncy pairs: EUR/USD, GBP/USD, AUD/USD, USD/CHF, GBP/JPY, EUR/JPY, AUD/JPY, NZ/USD. Trade only in the direction of the daily and weekly open indicators, (trend indicators). When the Super Trend Profit generates trades it changes colors. occur when the Super Trend Profit line is Blue. (confirmed trend change). occur when the Super Trend Profit line is red. (confirmed trend change). 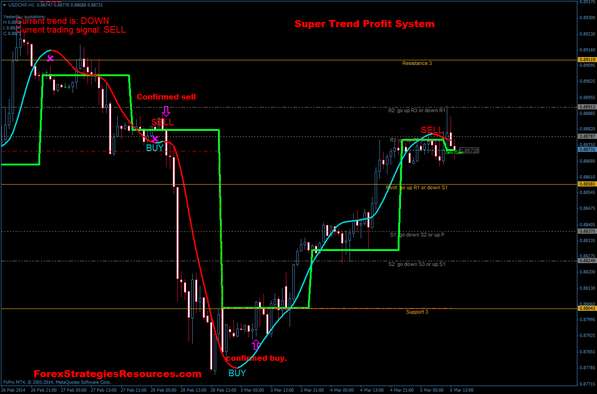 When super Trend profit indicator changes direction, or make profit or the fibo pivot levels. Initial stop loss on the previous swing. In the picture Super Trend Profit System in action. Send for me tutorial about super trend signal! Thank you! thank you so much Mario for posting you custom template ... invaluable!